The Keep Moreno Valley Beautiful (KMVB) mission is to build partnerships which inspire community engagement and enhance the quality of life and civic pride in the City of Moreno Valley. In recognition of the City’s affiliation with the Keep America Beautiful organization, the City encourages both business and residential communities to get involved and support KMVB’s mission and goals by way of their individual efforts at the workplace or in the home. These efforts include proper recycling/waste reduction; greening up our communities; and abating litter. The City of Moreno Valley is looking for volunteers who want to make a difference in their community. Students, church groups, boy scouts, and families are encouraged to get involved and help make Moreno Valley a cleaner, greener place to live. Volunteer efforts may be applied towards students’ community service hour requirements. The City of Moreno Valley’s Adopt-a-Road program encourages residents to participate in a community activity by keeping our community litter free. The goal of this program is to raise public awareness and to improve the appearance of our roadways. 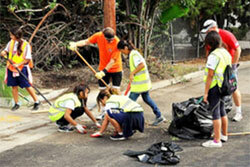 The Adopt-a-Road program allows residents to make a positive difference in our community. In recognition of your group’s efforts, a sign will be posted at the adopted segment displaying the name of your group. If you are ready to be part of this great program, please contact the Solid Waste and Recycling Office at 951.413.3109 or at movalrecycles@moval.org. Businesses located in the City of Moreno Valley are encouraged to take advantage of this great opportunity to advertise their business while beautifying the community through the Sponsor-a-Street Program. Sponsorship allows businesses to be recognized for their financial contribution to a safer, cleaner Moreno Valley. In return, sponsors receive recognition through multicolor logo signage on major thoroughfares. Current locations available on arterial streets with high traffic flows.